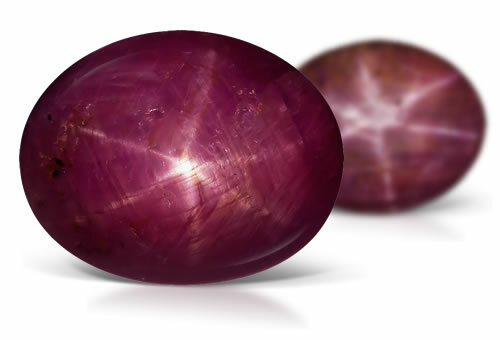 Star ruby exhibits the optical phenomenon called asterism, a star-like pattern created on the surface of a gemstone when light encounters parallel fibrous, or needle-like, inclusions within its crystal structure. Light that strikes the inclusions within the gem reflects off of the inclusions, creating a narrow band of light. When two or more intersecting bands appear, a star pattern is formed. Depending on the crystal, the star may have four, six, or even twelve rays. When only one band forms, it is classified as a "cat's eye". Stones are usually cut as cabochons. Star rubies will have silk or sets of parallel rutile needles that produce a 6-rayed star, hexagonal growth lines, color zoning, liquid, negative and mineral inclusions. Some stone might show twinning.